A recent arrival to the Arctic Fashion online shop, this gorgeous wooden necklace has a special Scandinavian design and an unusual colour - pistachio. Comprising a series of wooden pearls in gradually increasing sizes, the Kamelia wooden bead necklace is ideal for ladies who are searching for a striking wooden necklace design. This simple, but eye-catching wooden bead necklace can be used to dress up a casual outfit or add a touch of natural style to more formal attire. It is made from sustainable wood, which not only means it's eco-friendly, but also a delight to wear. Each wooden pearl has a smooth finish and the pistachio stain allows the grain of the wood to show through, adding extra depth. 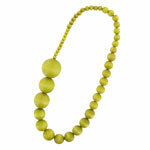 This lovely pistachio wooden necklace makes a great gift for ladies who love natural and colourful jewellery.